Poletje je krasen čas za barvanje z rastlinami. Vse bujno raste, vse cveti, da kar ne vem, s čim začeti ... pa delam vsega po malem. 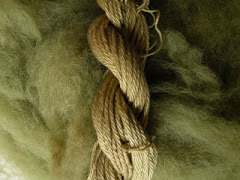 Summer is the excellent season for natural dyeing. 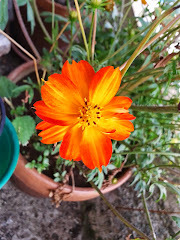 Everything grows abundantly, blooms exuberantly so I just don't know what to start with ...so I use more or less everything. Rabarbarine korenine sem imela v velikih kosih, pa sem jih tesno povila v štrene oprane volne, dala v velik kozarec, dolila toplo vodo in dala na sonce. Ker je bilo sonca dva tedna res veliko, je dobro opravilo delo - volna je rumena in živo oranžna, drap barva je pa od orehov. Rhubarb roots I had were in large pieces so I wrapped them tightly in skeins of washed wool, placed them in a large glass jar, poured in warm water and placed in a sunny place. 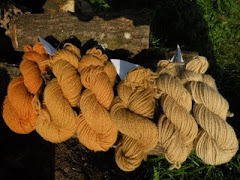 As the last two weeks were really sunny the sun did its job well - the wool yarn is yellow and bright orange, the beige part had been dyed with green walnuts. Imela sem tri štrenice različnih neizrazitih barv - izčrpana kopel šentjanževke, jelševa skorja in cvetovi kokardije - pa sem polovice namočila še v delno izrabljeno kopel zelenih orehov. 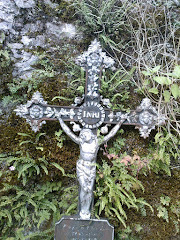 Zdaj je preja mnogo zanimivejša! I had three skeins of various plain colours - an exhausted bath of St. John's wort, another of alder bark and of cocardia flowers - so I dipped halves into a partly exhausted bath of green walnuts. The skeins look much more interesting now! Tidve štreni, pobarvani na soncu z rabarbaro, sem pomočila še v raztopino zelene galice. I dipped these two skeins that had been sun dyed with rhubarb roots into a solution of ferrous sulphate. Tele nežno zelene štrene mi je v kozarcu z lučnikom in bakrovim acetatom prijazno pobarvalo sonce. 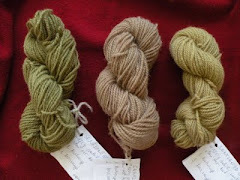 It was the sun that kindly dyed these lovely light green skeins in a glass jar with mullein flowers and copper acetate. Zeleni orehi, ki so junija odpadli po vetru in dežju, so dali tole čudovito temno čokoladno rjavo na volni. Green walnuts that had fallen from branches after rain and wind in June gave this miraculous deep dark chocolate brown on wool yarn. I love this dark chocolate walnut colour! I have 3 big walnut trees and they provide me every year with the most beautiful colours. The depth of the browns depend of how much rain we have during spring and summer. This year it's not that dark brown as yours on the picture. Hi, Alet! I also love the deep browns that green walnuts or green walnut husks give me. It is my experience that the depth of the colour obtained depends on the weight ratio of walnuts to wool, on the temperature and time of soaking or simmering walnuts, and on the temperature of the dyebath and length of soaking or simmering wool in the dyebath. I live in Slovenia where summers are hot so I suppose my walnuts get more sun than yours and produce more colour.